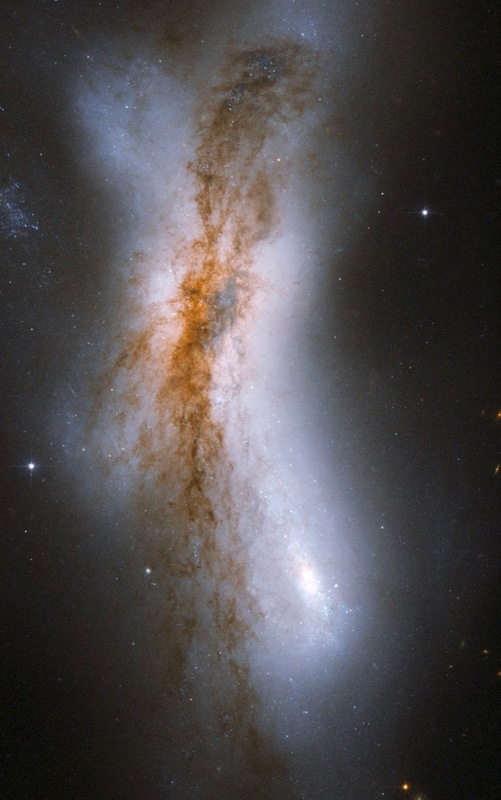 NGC 520 is the product of a collision between two disk galaxies that started 300 million years ago. It exemplifies the middle stages of the merging process: the disks of the parent galaxies have merged together, but the nuclei have not yet coalesced. It features an odd-looking tail of stars and a prominent dust lane that runs diagonally across the center of the image and obscures the galaxy. NGC 520 is one of the brightest galaxy pairs on the sky, and can be observed with a small telescope toward the constellation of Pisces, the Fish, having the appearance of a comet. It is about 100 million light-years away and about 100,000 light-years across. The galaxy pair is included in Arp's catalog of peculiar galaxies as Arp 157.